If we had any that is..... The grass sure looked crisp this morning but in the time for me to run for the camera and come back, the sun had warmed parts of the lawn. You can see it recently got its last cut for the year and a newly purchased leaf rake and leaf bags are waiting for the inevitable! You have to admire those last few roses that keep on blooming! (bottom right corner). Normally there is just the two painters. Lovely couple who have been painting homes for over 30 years together. Much of this plastic drapery disappeared today and they are settling in on the walls. 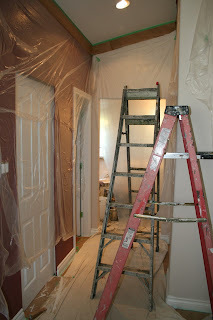 Bathroom has its two coats on both ceiling and walls. Meanwhile I hope to get this big pile of stuff back into the room soon. Bruce is emptying his den / office and they are heading to the other side of the house next. I can't imagine what doing the main open areas will involve next spring.... I'm going to like the end results, but no one said I had to like the process of getting there! So my latest project is off the loom and had hand sewing of the hems done, then washed, dried and the "bejesus" pressed out of the linen using the steam press and regular iron and board. Then tagged, wrapped and boxed to go off to Virginia. Sorry no pictures this time round. It was two runners 15 inches by 58 inches, plus a third one of 15 inches by 77 inches. I had planned for a fourth runner of 15 by 58 but it came up short at 45 inches. Being a thicker grist yarn, the take up was more than I allocated for. Notes will be made on the record sheets to that effect for the future! It seemed safer to get them wrapped and protected and shipped on their way rather than leave them in this chaos. I had no where to take pictures of them anyhow. 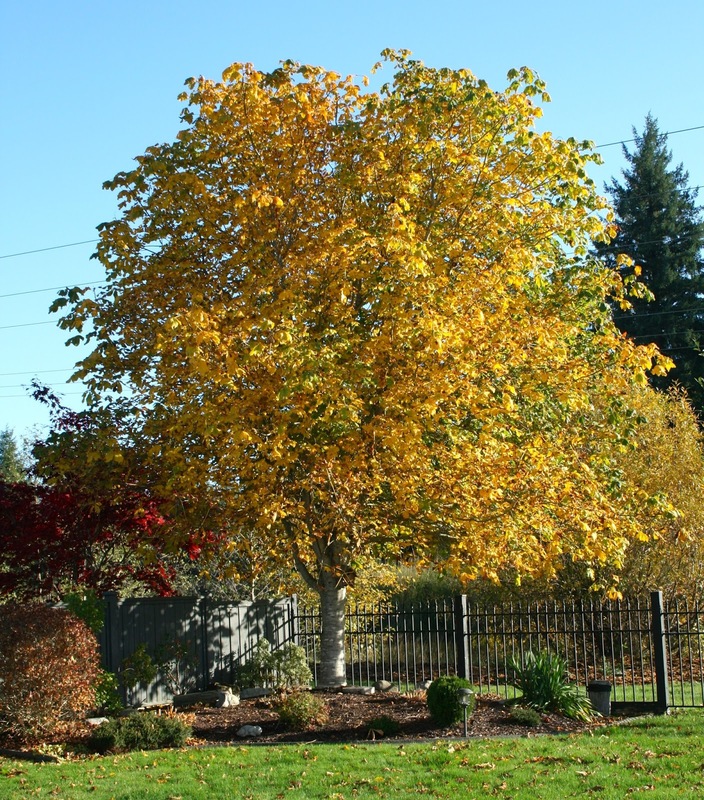 There's going to be one last warm summer like day today and I'm going to sit outside and spin on my wheel and enjoy the Fall colours in our back yard. Apparently from tomorrow onwards it will be below freezing at night and just barely above freezing during the day. Possibly snow on Thursday or sometime on the weekend. oh, joy! Hub has tuned up the snow thrower and brought in extra gasoline to run it. Happily, it will be a dry night for the little ones trick or treating on Halloween! The chestnut tree in our back yard is right on the point of letting go.... and all these leaves will drop soon. The rest of the garden has been cut back and tidied for winter. There have been three substantial wind and rain storms in one week and now we are enjoying a brief time of sunshine and warmer air. So much so that the furnace is turned off and the windows open to air out the house. I count us lucky right now as parts of northern BC received 55 centimetres of snow yesterday! The Japanese maple is turning deep red, with a few last rose buds on the shrub below. 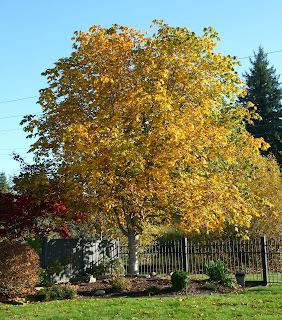 Out in the front yard our ornamental cherry tree at the end of the driveway is looking more like sugar maple! Beside the driveway is a bush I can never recall the name of but I call it burning bush. Its an eye catching red! We're supposed to get an early snowfall and possibly as much snow as last year, but maybe be warmer over all compared to last winter according to the Farmer's Almanac. Under all this mess is my dining room table..... and the mess is books and such from the studio. I had to empty the room as much as possible so it can be painted. I came up with the idea, signed on for it and looking forward to the conclusion, but in the meantime its chaos here! It was a photo finish to get the last warp off the Louet Spring and here I am, late at night, pressing hems and pinning them for some hand sewing. Then the following pictures were taken at the end of the first day. They were bringing in equipment and supplies and organizing the paint, plus double checking what's to be done. Its not an overly large space but they managed to bring in and set up five ladders (there are some little shorty ones out of camera view). 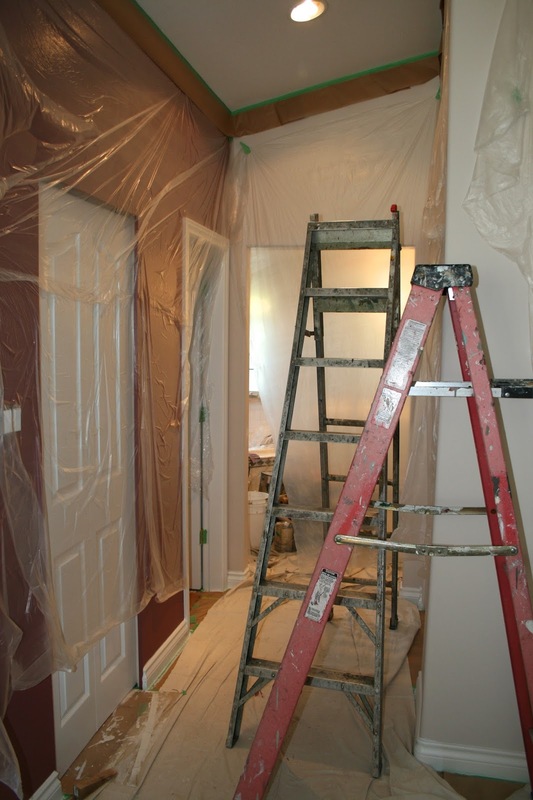 Day 2 went well with paint being rolled on doors and trims already... Day 3 is about to start with walls being done. The ceiling will be Saturday's job! I think they got the right height ladder worked out now. Once this room is all done they will move onto hubby's den and office, then the bedroom, main bath and a small hallway.... and this is our life for the next two weeks. We're up bright and early every day..... have I ever mentioned that I'm not a morning person? At least I can set up the studio again while they work on the other side of the house. We have yet to decide where and how we're to sleep while they paint the bedroom ! Indoor camping anyone? So this post is likely the only one for October and I'm sorry about that. I had intentions of posting more, and had some weaving underway but we were busy with end of the season house and yard maintenance, plus some medical appointments regarding my feet. Plain and simple, they hurt and its osteoarthritis. I'm not looking for sympathy here but simply saying that I needed to take things slower and that doesn't translate through to much in the way of interesting reading! 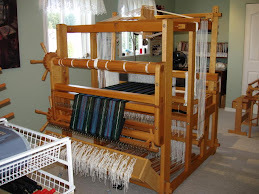 So once the painting is done and my house set to rights again, we'll get the looms moving again!